Today was another travel day. 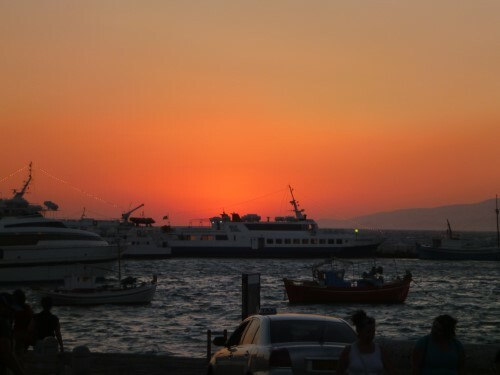 After being picked up at the Daedalus Hotel we traveled to the new port where we had some time for lunch before catching the Flying Cat 4 for our trip to Mykonos. 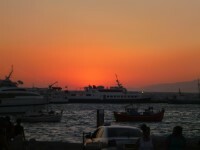 This is the same ferry we took to get to Santorini a few days ago. 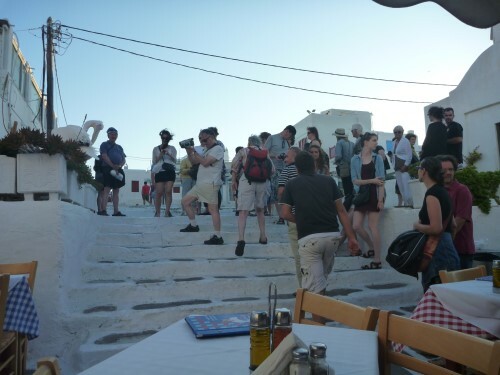 While we were going to Mykonos, several other couples we had met who were also traveling with Gate1 were staying at the Flying Cat 4's first destination, Paros. Too bad we didn't have more time off from work, it might have been nice to explore even more islands, but at least it gives us a reason to return again. As we were approaching Paros and for most of the trip from Paros to Mykonos we learned why the Flying Cat 4 is call a "flying cat." The wind had really picked up and the sea state had become quite choppy. 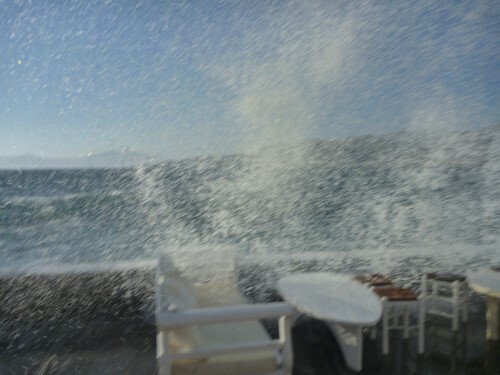 There were quite a few times where cat almost felt airborne and as it was crashing through the waves at high speed you could see the spray shoot past the window. While Alexandra and I enjoyed the ride, some of the other passengers were not as thrilled and started suffering the effects of seasickness. One of the crew started passing out barf bags, but he looked worse than most of the passengers. After arriving at the port in Mykonos we were greeted by a Gate1 agent and boarded a bus to the Dorion Hotel. 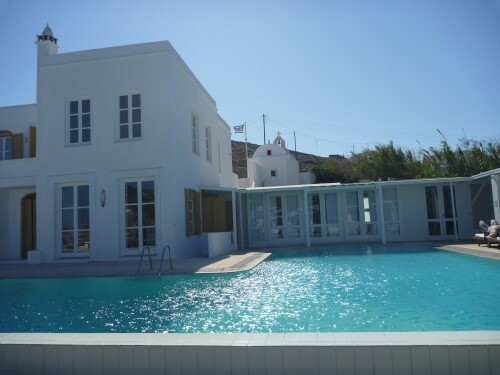 From our experience at the Daedolous Hotel we weren't quite sure what to expect from the Dorion, but were quite relieved when the bus pulled up and we saw a beautiful hotel not far from one of the best beaches on Mykonos. Our room was also much larger than our room in Santorini with a nice balcony and a large bathroom with a double sink and hot water with plenty of pressure. After settling in we decided to check out the pool. 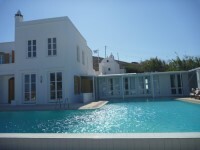 The hotel has a main pool around the main building plus several smaller pools around the complex. We decided to try out the main pool. Unfortunately even though we were on more of the leeward side of the island it was still extremely windy and the pool was getting big waves that were splashing out of the pool. The water in the pool was also rather chilly, so we just sunned ourselves on some nice deck chairs for a bit before heading back to the room where we received a call that the gate1 agent was waiting for us in the lobby. Meeting with the gate1 agent we decided it would be a good idea to rent a car this evening so we could have use of it for the night as well as tomorrow without having to deal with returning the car on Thursday when we were going to be picked up early for a tour of Delos. Someone from the rental car company picked us up a short time later and took us to their office to fill out the rental agreement. We ended up renting a Fiat Panda which was one of the least expensive cars with an automatic transmission. Unfortunately we found out later that while it had automatic transmission, it drove more like a stick shift with someone who didn't know how to drive stick behind the wheel. 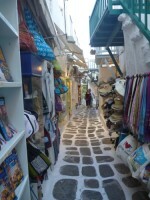 We drove to Mykonos Town where we parked in the free lot on the opposite side of the harbor from the town and then walked toward the town to the Folklore Museum. The wind was really whipping through the town and we unfortunately walked around the outside of the museum were a big wave crashed over the wall and got both of us wet. While I was amused, Alexandra was not so happy. We finally walked around the other side and found the entrance to the museum. The museum is housed in an old captain's mansion and was filled with historical artifacts, although I don't think either of us were too impressed, especially after having been hit by a wave to make it there. From the museum we walked around the town which is really interesting. 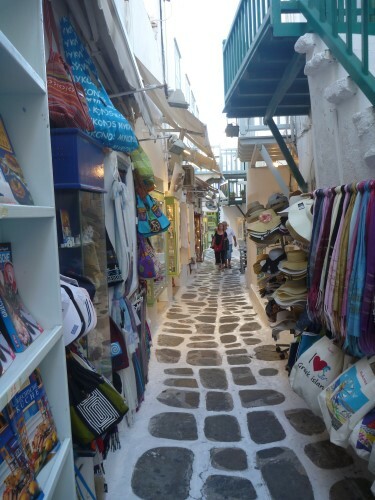 All of the buildings are tightly packed together with narrow pedestrian walkways that zig-zag through the town making it very easy to get lost. We ended up having dinner at Nikos Tavern. 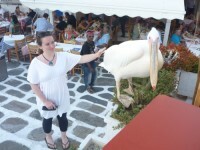 After we ordered, Alexandra looked up and saw a pelican sitting in a flower box near-by, not sure if it was real or not. Throughout our dinner groups of people kept coming by and taking pictures of the pelican. We finally got our chance after we finished our meal. Following dinner we wondered around a little more only to make it to the waterfront just as the sun was setting and caught the last minute of the sunset before heading back to the car and back to the hotel. Parking at the hotel was interesting since the parking lot was behind and above the hotel. To get to it you have to take a narrow little road with a very steep incline. Somehow the car had no problem making it up, although to me it felt like the car was going to roll over backward.